To be completely honest about orchids, they aren’t the least capricious flowers you can find out there. If flowers had moods, the orchid would probably be placed more at the top of the list rather than the bottom in terms of moodiness. Why is that so? Well, if you want such a unique flower to adorn your home, you’re going to have to make an effort. Simply watering it won’t be enough. It’s going to need sunlight, but don’t place it directly under the beams of the sun. It is said that knowledge is power, and we at Flower Shops undoubtedly have it on our side. What we can do is grow the orchid for you, or for the one you want to send it to, and you’ll receive the final result, which is either a faultless potted plant or an Vanilla Orchidsincredible flower bouquet with orchids included in it. Doesn’t this sound like an alluring offer? How can you not be tempted, especially if that’s your favoutite flower of all, and you just can’t grow it on your own no matter how many times and how hard you’ve tried? Sometimes, simple questions have simple answers, and that’s exactly the case. Order an orchid bouquet or a potted plant for you or someone else who you know loves this flower from our company, and you’ll be left with the impression that things are easier than what they seem to be. With us they certainly are! Having been cultivated by man a long time ago makes orchids suitable for every season because they can blossom regardless of the weather conditions outside and arrive to you right at their peak moment of bloom. And who if not us can deliver them?! If you are looking for a huge variety of choices, you surely can’t miss orchids. They come in so many species and colours that trying to memorize them all will most likely be an impossible task. That’s how diverse orchids are. One thing is for sure, though – they smell divine. Their petals tinted in different hues and even sprinkled with spots here and there look splendid on their own but even better in a combination with other flowers in an arrangement. 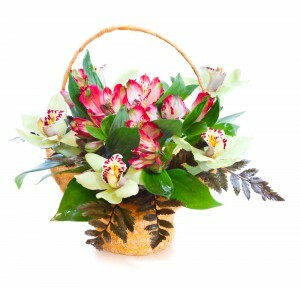 Their large leaves can be used as an additional decoration in a bouquet as well. There are so many other interesting applications of orchids, and not only as flowers. One of them is in medicine, and this is commonly used in China. There, orchids have been respected for centuries as a symbol of friendship, grace, fertility, moral strength and refinement. Look how much meaning can fit in only one flower. But probably the most popular use of them, known to all, is that a specific type of orchid is used for making vanilla. As elegant and delicate as they are, just by one look at orchids you’ll realize that this flower is like no other. It has its own behaviour, and you’ll have to give some consideration towhether you want one or not. It will cast a spell on you with its royal fragrance, and all that’s left for you is to obey if you’re willing to preserve this one-of-a-kind refined beauty. Reluctance is out of the question with this type of flower. As a truly great flower delivery company, Flower Shops is dedicated to its mission to always provide fabulous looking bouquets and stands fully behind the uniqueness of its flower arrangements. So, just pick up the phone and make a call on ‎020 3900 2440.